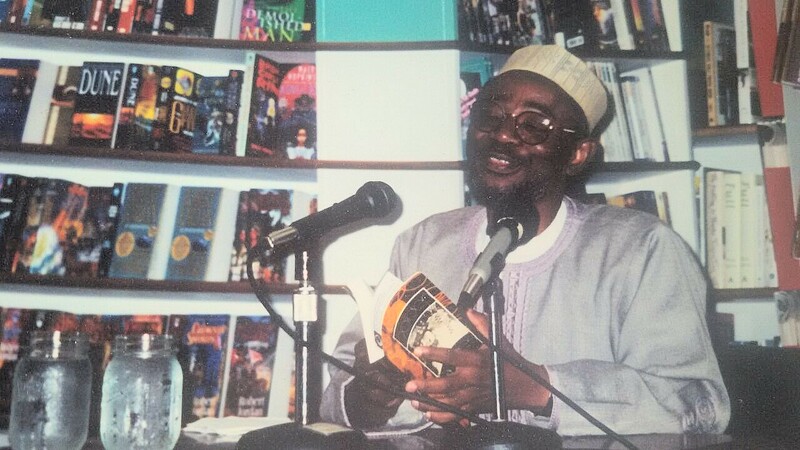 Gimba’s third and fourth novels, Innocent Victims (1988) and Sunset For a Mandarin (1991) chronicle his civil service experiences. The novels are slickly written to conceal details of the experience. As a student of historicism these novels are curious to me and I longed to extract it from him the contexts which inform their production. The questions I phrased to him on this issue were not answered before his death. In any case, as can be seen in the novels, it is apparent that they are vistas unto his civil service years. Innocent Victims is an exposé of cut-throat intrigues and machinations in the civil service culminating in the humiliation of Haj. Faruk Kolo. In the centre of this intrigue is Zaalim, the tribal bigot, who envies Haj. Faruk’s rise in the service and apparent uprightness as a thoroughbred and circumspective bureaucrat. Zaalim’s tribal bigotry manifests in his thought process. He is one who thinks from the particular to the general. He sees himself as the vanguard of his tribe, the one to champion the cause of his people’s marginalization in the service. He therefore engages in petition writing falsely accusing Haj. Faruk of financial misappropriation. Sunset for a Mandarin reads like a sequel to Innocent Victims. In this novel, the lead character, Hamzah, is a stoic personality who draws sympathy by the ordeal he is made to go through by his close ally, Waleefa. The novel is an extension of the intriguing mischief making in the civil service that was begun in Innocent Victims. Like Haj. Faruk in Innocent Victims, Hamzah too in this novel falls victim to the telltale of Waleefa. Like Iago in Shakespeare’s Othello, Waleefa is a villain whose motiveless motive is born out of the belief that “men in power seldom want to see those who walk upright around them. Often, those who crawl survive longest” (pg144). This is the bane of Hamzah as he becomes an object in the hands of Waleefa. The crux of Waleefa’s grouse is that he wants the position Hamzah occupies as the Director–General, Treasury Department. This is what sparks the rivalry between them, with Waleefa gaining an upper-hand because of his closeness to the SMA, Commander Abbud. He thus uses his affinity with the SMA to frame Hamzah in a case of misappropriation of fund in the sum of 14.2 million Songainian Dollars. This leads to Hamza’s subsequent humiliation and travails. the best. The most enduring. The abdication of these roles, especially of being wives and mothers, is what in the words of Gimba, has produced “near-Frankenstein creatures all over the world’. The strong message which Gimba preaches in this novel is that the family and marriage institutions are sacrosanct and women are the honoured molders of these institutions, and that motherhood cannot be out sourced. The sixth novel, Footprints (1998) is a sad commentary of the parlous political situation in a typical developing country like Nigeria. It examines the leadership crisis and breakdown of law and order and the socio-economic malaise that are foisted on the helpless citizens. By drawing attention to these issues, Gimba wittingly emphasizes the need for African leaders to be considerate in their rulership. He sends a strong message that the atrophy of the society can only be redeemed if the leaders carry along the people and the followers also behave responsibly. A Toast in the Cemetery (2003) is a collection of short stories which treats variegated themes. It is as I have stated elsewhere an unequivocal statement on “the degenerating socio cultural life in Nigerian society as well as the quest for racial amity among people of African descent in the diaspora” (Ismaila, et al: 2008). The stories are Gimba’s way of drawing readers’ attention to the seamy side of issues which preoccupy him in the hope that in the process they would be spurred to demand the good side. What I have tried to do here is to make a tentative statement about Gimba’s subtle proselytisation in his fictions. Of course, this is subject to further research and reaffirmation. However, I am unwavering in my claim that running through Gimba’s works is an unequivocal voice note of a preacher who nudges his readers to appreciate his perspective, to see the good side of the seamy side of the issues he so painstakingly wrote about. Abdullahi Ismaila Ahmed is of the Department of English, IBB University, Lapai, Nigeria.